I have this statue on my hearth in my living room. It is a bronze pug - Victorian style. 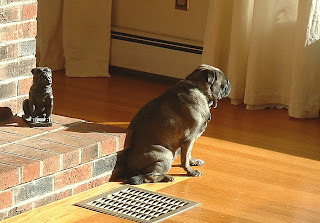 Often in the mornings I will catch Gillie sitting next to it in the sun. It's like Gillie has her own "Mini Me". Taking a picture is difficult because she can see me coming with the camera and moves in for her close up. Today I caught her....... close enough but she was sleeping so I snuck up in her. Isn't it funny??? Aww... that's so cute! Nice to see my girl soaking up the sunshine!! too cute...I could use a bit of that sunshine, can you send some...? Jelveh Girl! I would send you sunshine but are you sure you want the temps that go along with it??? It was 24 today!!! And when I say it is cold...it is cold! I love winter but today was shocking!!! She sits there every morning! And she watches the sunrise too.